More than 3,000 years ago, an army of Israelites led by King Saul confronted a force of Philistine invaders in the valley of Elah. As the Philistines occupied a mountain on one side of the valley, and the Israelites occupied another on the opposite side, an enormous champion clad from head to foot in bronze, wielding a gigantic spear, emerged from among the front ranks and addressed the Israelites. The warrior declared himself as Goliath of Gath and challenged any soldier among them to face him in single combat. None of the Israelites was brave enough to fight the mighty Philistine warrior, except for one. The challenger was not a soldier, but instead a young shepherd named David. This story was first published in the May 2015 edition of Military Heritage. Order your subscription here! At first King Saul refused to let the youth accept the challenge, stating that the boy was too young and inexperienced to defeat such a warrior. However, David’s exceptional confidence quickly changed the king’s mind. Saul offered David his own armor to wear, yet the shepherd respectfully declined once he realized how greatly the armor hindered his movement. Instead, David approached Goliath unarmored, armed simply with a sling in his hand, a sword in its scabbard on his side, and five smooth stones taken from a nearby stream that he kept in a small bag. As David got closer to the Philistine, he rushed forward and loaded his sling. While still running, he released the missile and struck the giant warrior directly in the forehead, killing him instantly. David then beheaded Goliath and brought his head to Jerusalem in triumph. The story of David and Goliath is a perfect example of the deadly efficiency of the sling in ancient warfare. Although the bow and javelin are much more famous ancient weapons, the sling was just as important to ancient skirmishers. Due to the small size of its missiles, making them nearly invisible when released at such high velocities, the sling was particularly hard to defend against. This is especially true considering that the blunt trauma caused by the small stones upon impact could damage organs, shatter bones, and cause concussions or kill those struck in the head, even when the victim was armored. In the 1st century B.C., the Roman medical writer Celsus stated that sling stones could even penetrate skin and become lodged within a victim’s body. The most skilled slingers of the ancient world were even more accurate and had a far greater range than many archers, making them some of the most prized skirmishers available. Since it is one of the simplest ranged weapons to construct, the earliest evidence of the sling has been dated back to 10,000 B.C.. Ancient warriors typically used animal hides and plant fibers to make the pouch, while hair or sinews were used for the cord. The earliest ammunition was even easier to find because smooth stones were readily available along streams, lakes, rivers, and oceans. While the construction of the sling remained relatively the same for thousands of years, the differing sizes of the stones used decreased the overall accuracy of the sling, which led to several different innovations concerning the ammunition. By the end of 7,000 B.C., slingers of the Near East began to use carved stones or baked clay that were manipulated to a uniform spherical shape, which greatly increased the accuracy of the missiles. The range of the sling was much improved by 3,000 B.C. when the stone and clay ammunitions were made into biconical or ovoid shapes instead of spheres. As shown by the story of David and Goliath, the sling was a common weapon used by the Hebrews on the battlefield, but the ranged weapon was also their primary weapon in siege warfare. When the Hebrews besieged the Moabite city of Kir-hareseth in the 9th century B.C., their slingers were so devastating that the Moabites were forced to send out 700 warriors to end the siege, but they were instead driven back to their fortifications. Like the Hebrews, many armies of the ancient world used slingers when conducting sieges because the arching trajectory of sling projectiles meant that they could fly over walls and still strike defenders. The armies of the Assyrians also included many slingers within their ranks. The Assyrians also used slings effectively in siege warfare. In 701 B.C., the Hebrews witnessed the lethality of slingers from the opposite perspective as the Assyrians used the deadly troops to launch missiles over the walls of the Judean city of Lachish while they moved their siege engines into position. Even though slingers were an important part of the Assyrian army, the skirmishers never came close to the prominence given to the archers. With the rise of the Greek city-states in the 6th and 5th centuries B.C., much more of an emphasis began to be placed on heavy infantry as opposed to light infantry. Many Greeks favored the close combat of hoplite tactics over ranged soldiers like archers and slingers. Yet the importance of skirmishers was never fully overlooked, which led to the rise of specialized troops who served as mercenaries for armies throughout the ancient world. Some of the most highly skilled slingers of that time period came from Rhodes. These Hellenistic slingers used lead projectiles, which drastically increased the damage caused upon impact since they were more than eight times denser than clay or stone missiles. Even with lead ammunition, mercenary slingers were still more cost effective than archers because the lead projectiles cost less than typical arrows. The importance of slingers increased within Greek armies during the Peloponnesian War and in the decades afterward. When the Athenian army carried out its Sicilian expedition in 415 B.C., General Nicias made sure 700 Rhodian slingers were in the ranks, which was a larger number than the Cretan archers included in the force. The famous mercenary group known as “The Ten Thousand” contained warriors from Rhodes as well, but they were not initially included because of their skill with the sling. Yet over time, the Rhodians among the mercenary force increasingly relied on the sling. They were pivotal in several confrontations because the range of their missiles was greater than those of the Persian slingers who still used stones, and the Rhodians could even fire at greater distances than the archers. Slingers from Rhodes were not the only ones who fought with the ranged weapon throughout the Hellenistic Age. Skilled slingers also came from Acarnania and Achaea, and when the Boeotians required slingers for the siege of Delium, they recruited them from the Malian Gulf. By the 4th century B.C., Thracian mercenaries were also hired as slingers; however, most Thracian light infantry were javelinmen or archers, making slingers a very small portion of the manpower available. Due to their extremely modest backgrounds as shepherds or herdsmen, Thracian slingers used whatever was available to them, which often meant stones rather than lead projectiles. The Macedonians under Philip II recruited Thracian slingers, but also had their own corps of the ranged skirmishers as well. When the Macedonians besieged the city of Olynthus in 348 B.C., slingers were in the armies of both sides. Much like the Assyrians had done before him, Philip ordered slingers to assault the walls first to distract defenders as siege engines and scaling ladders were brought to the fortifications. Slingers of the Macedonian army continued the practice started by earlier Greek armies of inscribing names or slogans on lead bullets; for example, archaeologists found a bullet with a message for its enemies stating, “Take that!” Bullets from Macedonian slingers have been recovered around Olynthus with similar messages, such as “a nasty present,” or with the names of officers, or even King Philip. 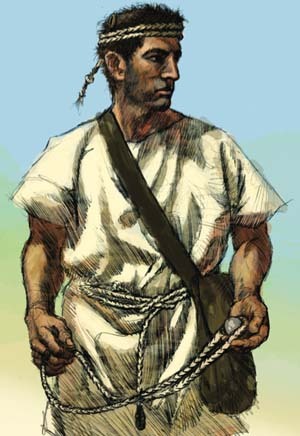 A Balearic slinger wears a spare sling as a headband and carries a bag of missiles at his side in a modern illustration by Johnny Shumate. The Balearic slingers played a key role as skirmishers for the Carthaginian armies during the Punic Wars. The main reason that slingers were only found among certain groups and fought as specialized corps in the ancient world was because the sling required a much higher level of intensive training than any other weapon. Even the bow with its point-and-shoot firing can be mastered over a matter of years at almost any age, while the sling had to be practiced from childhood to achieve an adequate level of proficiency. Without the proper amount of training, it is extremely difficult to even launch a missile in the right direction. Therefore, cultures with a heritage of mastering the sling began the instruction as early as possible. According to the Roman historian Livy, slingers from Aegium, Patrae, and Dymae began training as children to launch projectiles at great distances through rings about the size of heads to simulate striking enemies in the face. Arguably the most famous and skilled slingers of the ancient world were those from the Balearic Islands in the western Mediterranean. They underwent similar vigorous training from a very early age. Parents gave a sling to their children as their first toy so that they would become familiar with it as quickly as possible. Once familiarity had been achieved, a piece of bread was placed on a stake in front of the children. The parents withheld food from their children until they could successfully hit the bread and knock it off the stake. Using these severe training techniques, Balearic slingers became masters of three different sizes of slings used to launch projectiles at varying distances. While on campaign, extra slings were wrapped around the forehead or the waist. Interestingly, Balearic slingers occasionally used lead bullets, but they much preferred the use of stones. Throughout the 5th and 4th centuries B.C., the Carthaginians continuously recruited Balearic slingers. According to Greek historian Diodorus Siculus, the first Balearic mercenaries were hired in exchange for women and wine because the islands did not have a monetary economy; however, Carthaginian influence quickly changed that, which led to recruitment officers carrying huge payments when they arrived at the islands for the rest of the 5th century. Many times these ranged mercenaries were used in conflicts with the Greeks of Sicily, but by the 3rd century their primary enemy became the Romans. Before Hannibal invaded Italy in the Second Punic War, he left 500 Balearic slingers to help hold Spain and sent 870 of the projectile troops to Africa to defend Carthage. The remaining Balearic mercenaries, numbering more than 1,000 slingers, accompanied him on his campaign against the Romans to great effect. At the Battle of Trebia in 218 B.C., skirmishers, including the Balearic slingers, were the first Carthaginian warriors to confront the Romans in an attempt to disrupt the front lines before Hannibal led the army to a decisive victory. Two years later at Cannae, Hannibal once again ordered his Balearic slingers and other skirmishers to confront the Roman skirmishers at the beginning of the battle. The Roman skirmishers included Cretan archers as well as light-armed, javelin-wielding velites. The light infantry spearmen of the Carthaginians would have been similarly armed as the Roman velites, and due to the shorter range of the javelins on both sides, the two forces advanced in front of the other skirmishers and confronted each other at the center of the battlefield. The Cretan archers fired on the Carthaginian army from behind the velites, as did the Balearic slingers from behind their javelin men, but with much greater effectiveness due to the increased range of the Balearic slings. Because of the large, heavy arrowheads preferred by the Cretans, their arrows were only accurate at a distance of a little more than 442 feet, while the sling could launch projectiles at least 492 feet, and most likely even farther due to the incredible skill of the Balearic slingers. While the skirmishers confronted each other, the heavier line infantry of both armies formed up into position. The distraction of the skirmishing was particularly important for the Carthaginians because it shielded their movement into the peculiar crescent-shaped formation in which Hannibal had ordered them to advance. As the skirmishers of both sides retreated behind their infantries, the cavalry contingents of both armies collided on each wing and the line infantry advanced. Just as with the confrontation of the skirmishers, the Carthaginian cavalry held the upper hand against the Roman cavalry. The Spanish and Celtic mercenary cavalry contingent completely routed the Roman equites on one wing, and the Numidian light cavalry kept the auxiliary cavalry of the Latin allies completely preoccupied. After the two infantry lines collided in the center, the Roman heavy infantry had much more success against the Celtic and Spanish infantry. Yet as the Romans pressed their advantage forward in the center, the awkward crescent formation of the Carthaginians kept their flanks out of reach of the Roman front line, causing the Roman soldiers on each side to naturally gravitate toward the center where the combat was and gradually decrease the length of the front. Hannibal then used his Balearic slingers and other skirmishers to once again shield the movements of his Libyan infantry on the flanks, which advanced forward to attack the Romans exposed flanks. The trap worked perfectly as the Romans soon found themselves surrounded on three sides. The end for the Romans came after the Latin allied cavalry fled the battlefield. The allies immediately retreated once they saw the Celtic and Spanish cavalry approach them from behind. The Numidian cavalry pursued the retreating horsemen, which left the Celtic and Spanish cavalry free to attack the rear of the Roman infantry and completely envelop the army. A massacre of Roman soldiers followed, as Carthaginian forces slaughtered almost the entire army. To add to the devastation, Hannibal ordered his Balearic slingers to rain barrages of missiles down upon the Roman mass. Even if their missiles did not instantly kill the Romans, any hits to the head would have brought soldiers to the ground where they were inevitably trampled to death. After Cannae, the Balearic slingers continued to fight for Hannibal and the Carthaginians for the rest of the Punic War. However, after the Roman victory at the Battle of Zama in 202 B.C., the Carthaginians were put on an irreversible path of decline. Therefore, slingers from the Balearic Islands were fielded less frequently by the North African city-state. Eventually the Romans destroyed Carthage, and from then on the conquerors continued to expand their dominion over the regions of the Mediterranean. An Egyptian sling from 1900 B.C. Slingers improved the accuracy of their missiles by using carved stone oor baked clay fashioned in biconical or ovoid shapes. In 123 B.C., the Roman consul Quinctus Caecilius Metellus sailed toward the Balearic Islands in search of a place to land his invasion force. Native opposition was fierce, especially from the skilled slingers on the coasts who launched so many missiles at the Roman ships that the consul was forced to order the men to protect the sides of the vessels with animal hides. Yet, just like the Carthaginians, the Balearic Islands also fell to the Romans and from then on the lethal slingers predominately fought for Rome. The Romans also encountered slingers on several occasions when they faced the armies of Gaul. Like the Thracians, the Gauls did not have many slingers. The Celtic warriors generally preferred to fight up close, so their main ranged weapon was usually the javelin. However, their slingers were still effective skirmishers. In 54 B.C., as one of Caesar’s officers, Lucius Cotta, was riding down the line and encouraging the front ranks, a Gallic slinger struck him directly in the face and severely wounded him. To counter the threat posed by slingers in his conquest of Gaul, Caesar brilliantly recruited the renowned Balearic slingers. Even though the Romans occasionally used slingers in their armies, there were never any cohorts created specifically for that purpose. Since there were no communities of Romans who trained their people from childhood with the sling, the Romans continued to rely on foreign auxiliaries such as the Balearic slingers. When the Romans besieged the city of Same on the island of Cephallania in the 2nd century B.C., they recruited slingers from Achaea. The range of the Achaean slingers was so great that they could strike the Samean defenders without any fear of being struck back. In the 1st century ad, the favored siege weapon of the Hebrews was used against them once again when the Roman emperors Vespasian and Titus recruited Arab slingers for sieges in Judea. Gradually, slingers began to fade away from warfare in Europe and around the Mediterranean, mostly because the cultures that once emphasized training on the weapon stopped the practice. This happened for several reasons, such as conquered peoples assimilating the culture of their conquerors and discarding native traditions, but was primarily due to the weapon becoming increasingly obsolete over time. The downfall of the sling began with the invention of the cestrosphendone by the Macedonians around 170 B.C.. The weapon consisted of a sling attached to a wooden shaft that launched a heavy dart. Although it sacrificed range, the weapon did not require anywhere near the amount of training needed to use the sling effectively. By the Middle Ages, a variant of the cestrosphendone, known as the staff-sling, was the projectile launcher that eventually fully replaced the sling in sieges throughout Europe. It was also easier to operate, had the ability to launch larger projectiles, and the missiles launched had higher arcs in their trajectories, making the staff-sling even more suited to siege warfare than the sling. In addition, the staff-sling doubled as a close-combat weapon and was more reliable when launching early grenades over fortified walls in the late Middle Ages. After several innovations to the bow and the crossbow, the two became the much preferred ranged weapons throughout Medieval Europe. Siege defense especially became more suited to bow-type weaponry as fortifications began to increasingly include slits or small holes to shoot through so the soldier was completely protected by the walls. 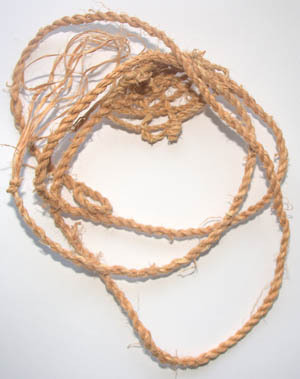 Slings continued to be used in naval warfare since the constant moisture could damage bowstrings, and they were especially effective when used by the Byzantines to launch pots of Greek fire at enemy ships. But once gunpowder was introduced in Europe, the sling became obsolete. Tags Ancient Greece/Roman Empire, ancient weapons, Battle of Zama, Carthage, Celtic warriors, Crossbow, David & Goliath, Greek Fire, Hannibal, javelin, Jerusalem, Macedonian, Numidian, Peloponnesian War, Romans, Sling, spear, weapons.